THIS EVENT IS NOW FULLY BOOKED. WE WILL RUN MORE THAN ONE NEXT YEAR! 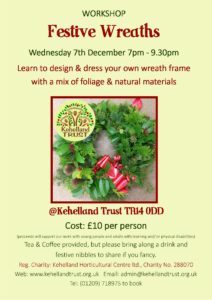 You are invited to come to the Tractor Shed, Kehelland Trust, on Wednesday 7th December for a Festive Wreath Making workshop. The event will run from 7pm until 9.30pm. All materials are provided, along with tea and coffee, but please bring along a drink and some festive nibbles if you fancy. We will be working with a copper wire wreath blank, although some may like to bring the willow wreath they made last year to dress. We will learn to design our wreaths and add foliage to them to our own taste. Cost is £10 per person. Please telephone (01209) 718975 to book. N.B Whilst we will provide a good range of foliage and ‘accent’ material, you may have particular ribbons or decorations you would like to add to your wreath. Please bring these along with you.